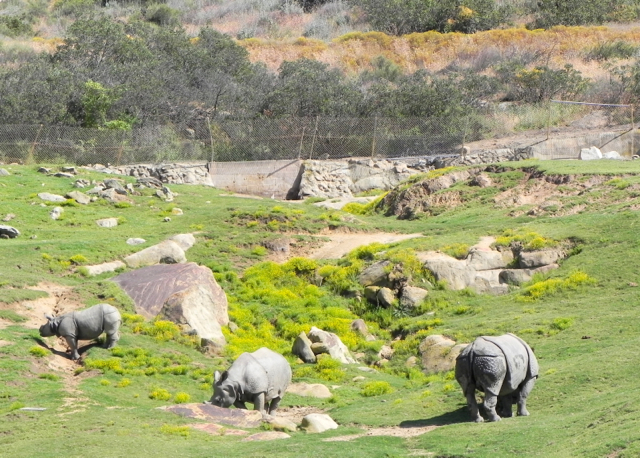 Can you spot the rhinos? I first visited the San Diego Zoo Safari Park in 1985. I think I may have been wearing those thick bunch socks with my Reeboks and a Mickey Mouse t-shirt. I think it may also have been called the San Diego Wild Animal Park at the time. But what I remember for certain is that we rode a monorail around a large area where giraffes and rhinos roamed freely and that I thought this was the most amazing zoo I’d ever visited because: Monorail! 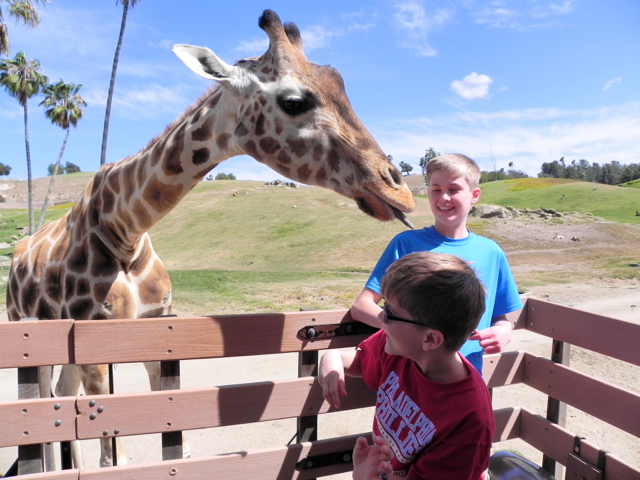 So when I planned a multigenerational spring break trip to San Diego with my in-laws and 10- and 12-year-old sons, I knew that a visit to the Safari Park needed to be part of our itinerary. This was especially true because my younger son is an inveterate lover of animals. 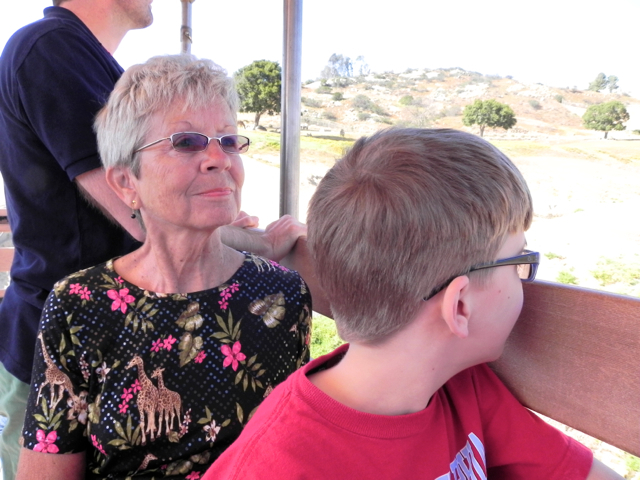 When we arrived on a warm spring day with four passes to the park that had been kindly given to me by the San Diego Zoo I realized immediately that things weren’t quite the same as they had been thirty years previously. For one thing, the monorail has been replaced by a tram. For another, in addition to the general exhibits that everyone with an admission ticket gets to see the park now offers visitors the chance to choose from a variety of safari experiences including a zipline that flies over the African exhibit. 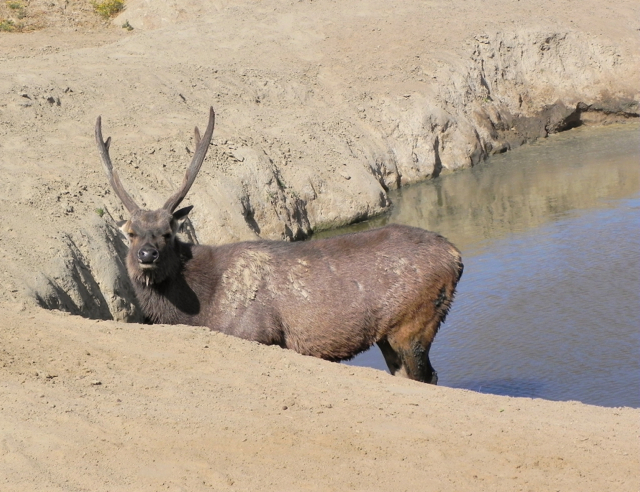 But what hadn’t changed was the size and breadth of the San Diego Safari Park. It still offers visitors a unique interactive opportunity to see animals in more natural habitats than I’ve seen in any other zoo. There are lots of places to encounter birds at the Safari Park, often up close. 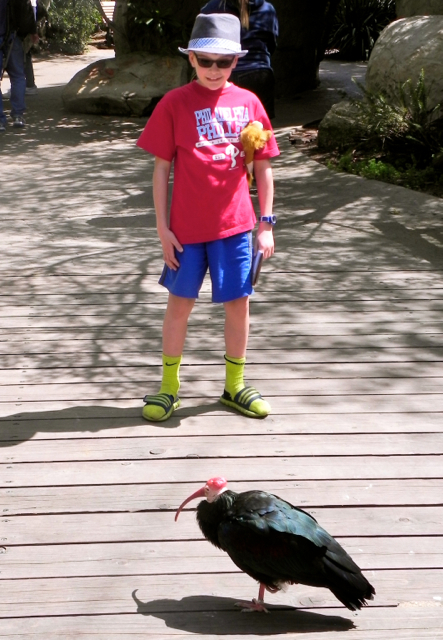 My younger son Teddy said a delighted how-do-you-do to a Bald Ibis. Teddy couldn’t believe this guy just walked in front of him. 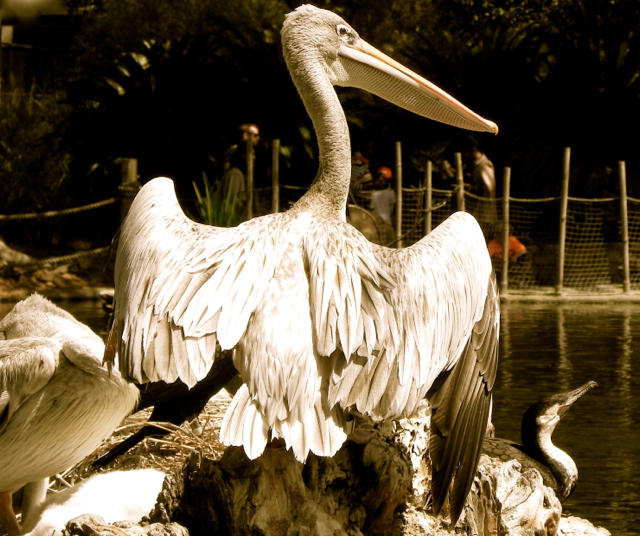 We also got near enough to this pelican to smell him. It was, er, not exactly delicate. This fellow definitely had his own aroma. 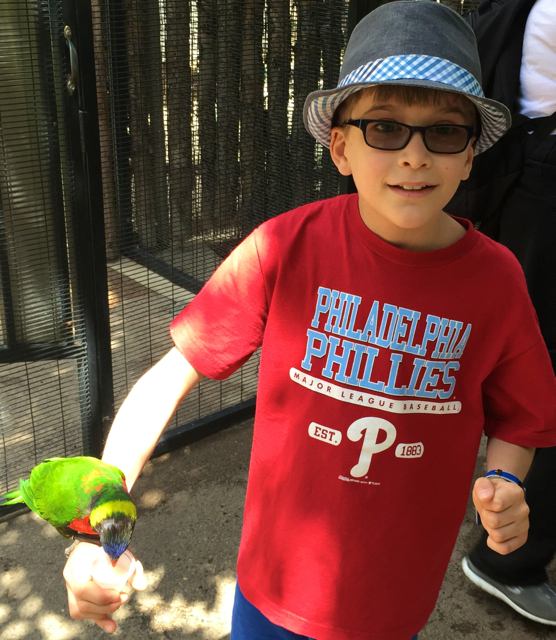 Teddy kind of loved feeding the lorikeets – and also kind of hated it. Before it finished the cup of nectar he was asking us to take it off his arm. But I loved their bright colors. Um, I kind of like this lorikeet. Can you get him off me now? 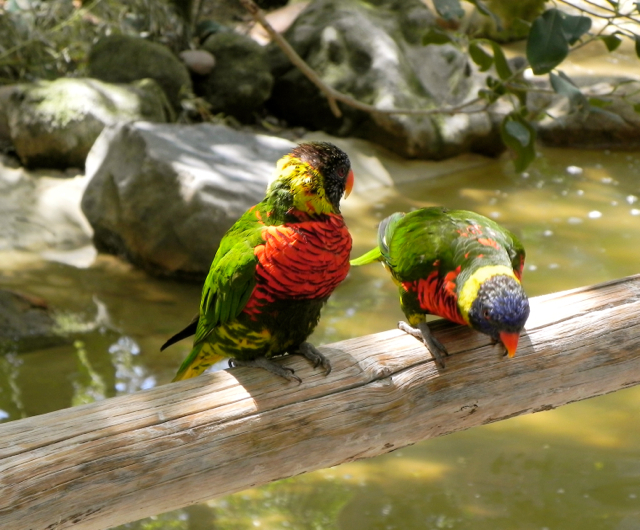 The lorikeets were very cheerful, maybe because kids feed them all day. Other birds we met included pelicans, several California condors, and a blue macaw. As we walked around the park we periodically happened across trainers talking about animals and showing guests what and how they ate. This cat had the coolest tufted ears – it was fun to see them so close up. I loved the tufted ears on this cat. This monitor lizard enjoyed a several snacks. 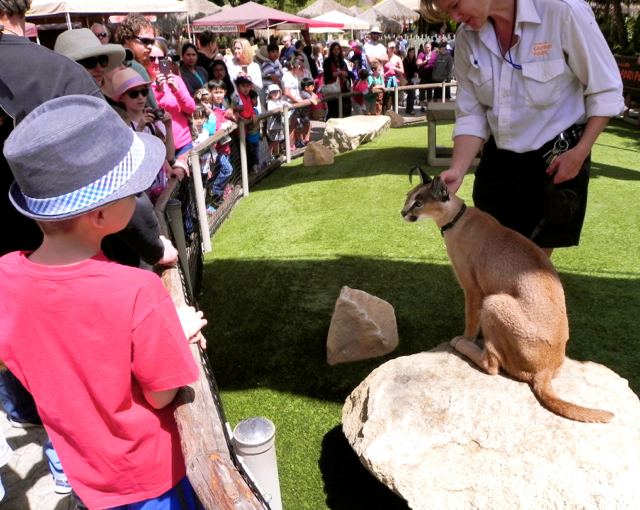 These presentations are called Animal Encounters and if you’re more of a planner, you can visit the Safari Park website and plan exactly when to see them throughout your day. 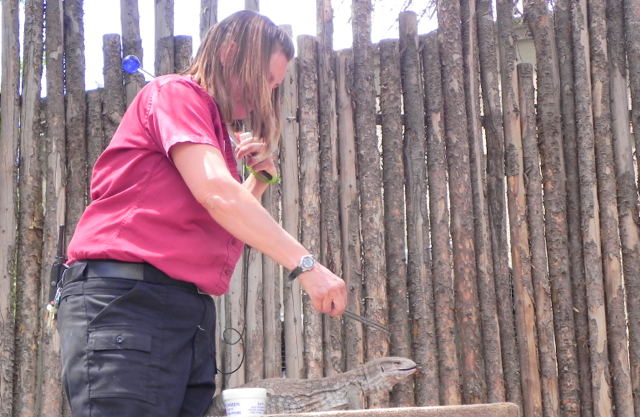 There are also volunteer docents stationed throughout the zoo to answer questions and interactive displays with information about the animals. 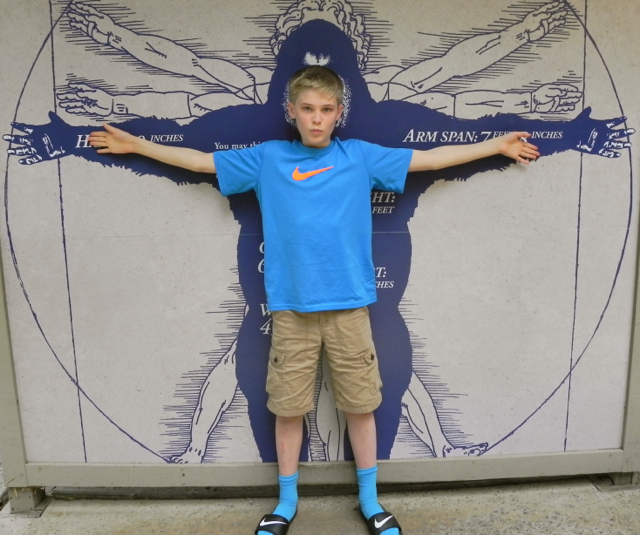 Whose bigger – boy or gorilla? I’d like to make it to Africa and Asia to check out the animals one day, but even if I don’t I’ll know I had a pretty great opportunity to get close to any number of rare and endangered species on the Caravan Safari. This two-hour program takes small groups of visitors into the middle of the African Plains and Asian Savanna exhibits – and is actually the only way to see the animals in the latter. Riding on the Caravan Safari was cool and comfortable. The ride takes place in a covered cart that’s pulled by a truck. Our guide Jeanne has worked at the park for years and knew a tremendous amount about all animals. A gaggle of giraffes? A group of giraffes? A herd of giraffes? Our first stop was in the middle of a gaggle of giraffes. One of them obligingly ambled over and we all fed her. Jeanne, who was on a first-name basis with every animal, told us she was called Wanda. Some of us were more enthusiastic about this process than others. On other tours guests have the chance to feed the African Rhinoceroses, but they weren’t in the mood to approach the truck the day we were there. We did get lots of stellar views of them though, as well as information from Jeanne. Did you know that they don’t make any noise when they run? It’s because they don’t have hooves. I’ve never been that close to a rhino before. 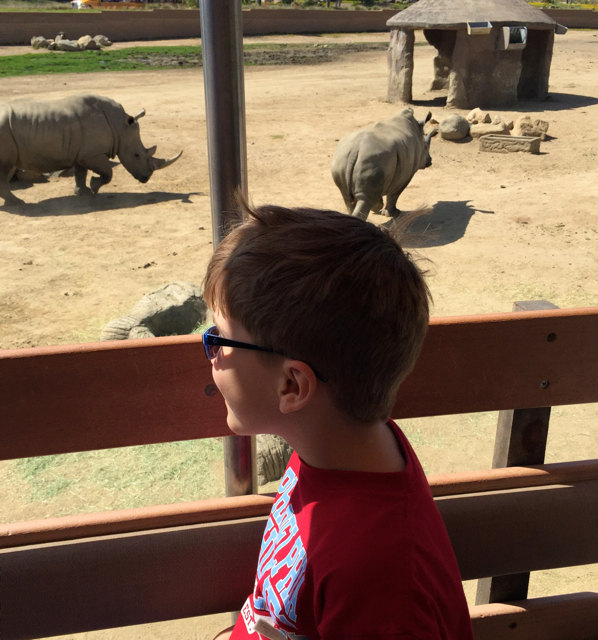 We checked out the Greater One-horned Rhinos from a bit more of a distance. 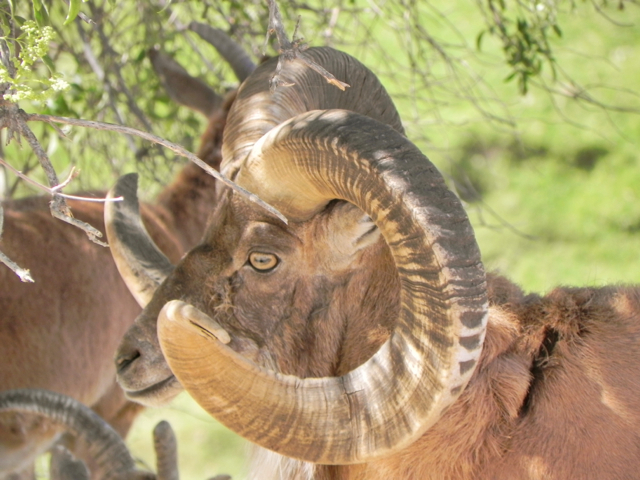 While it was fun to see the more familiar animals on the Caravan Safari, I enjoyed the chance to learn about the less common species, many of which are in danger of extinction. 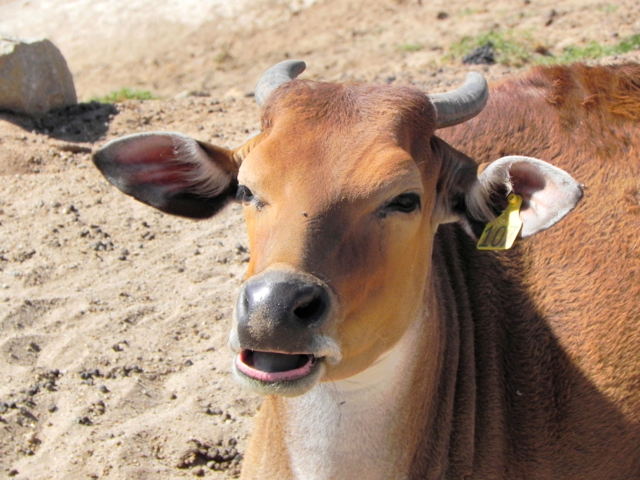 Would you believe that the most endangered animal is this Indian cattle called a gaur? 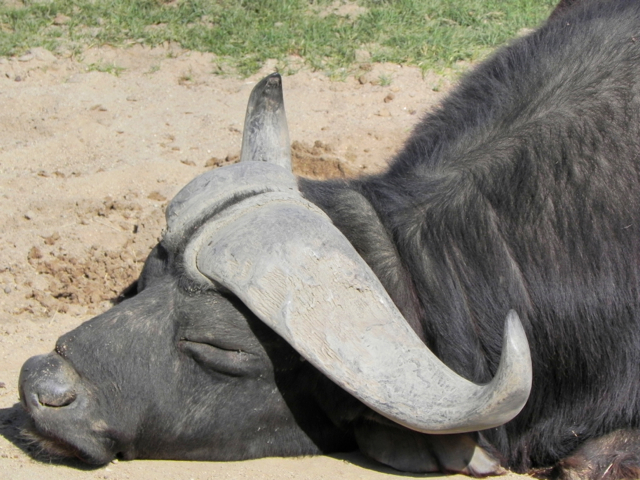 Apparently you don’t want to mess with a gaur. 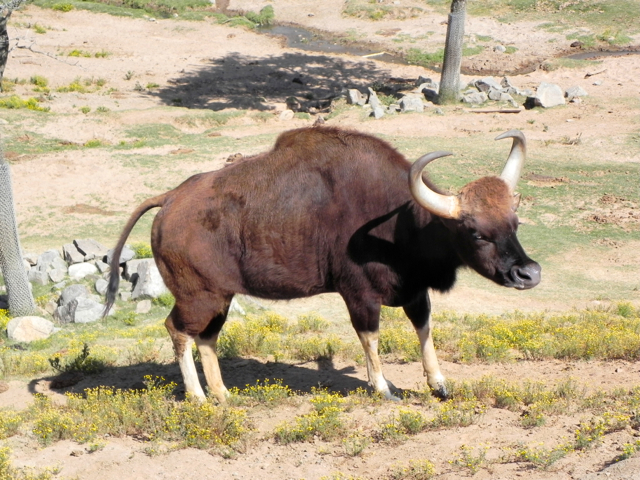 Would you also believe that this is one of the more dangerous animals in the exhibit? Jeanne told us that the last thing we’d want was to be charged by one. Apparently they have quite a temper. 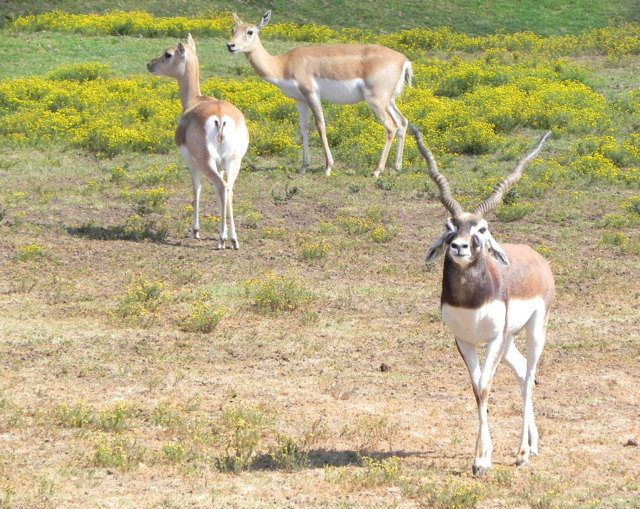 We saw a male Blackbuck Antelope waiting hopefully to make some time with the ladies (who mostly ignored him, paying attention only to their young ones). Just hanging out, trying to impress the ladies. We heard the thrumming sound made by the hooves of wild horses and watched them move in a cloud of dust. We checked out camels and discussed the difference between antlers and horns (the former fall off and grow back, the latter don’t). Obviously he has a stressful life. Glad I was in the cart and not in front of this guy. And chill animals hanging out in the mud. Apparently this deer likes not just to stand in, but to drink mud. We even saw those who looked like they were about to speak. What do you think she’s going to say? All the while Jeanne explained what we were looking at, where they live on the Asian or African continent, and what their habits are. It made such a difference to look at the animals in the company of an experienced guide who could answer our questions. 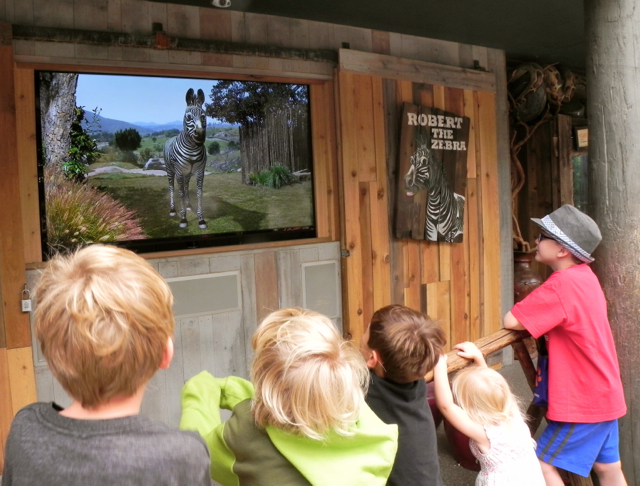 Even though the Caravan Safari was special, the rest of the Safari Park also offers a chance to enjoy some interactive experiences. The enclosures are large, but somehow it seemed like we had amazing views and access to the animals there. 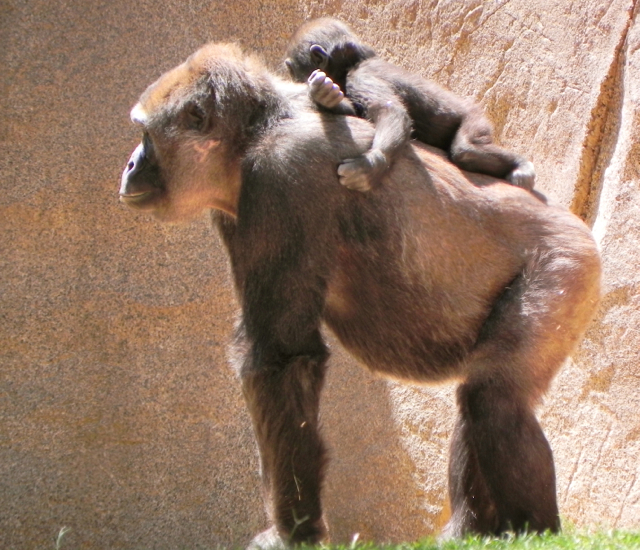 We spent a very long time at the Gorilla Forest watching a mother carry her baby around on her back. I could have watched that baby all afternoon. We also hung out with the meerkats. 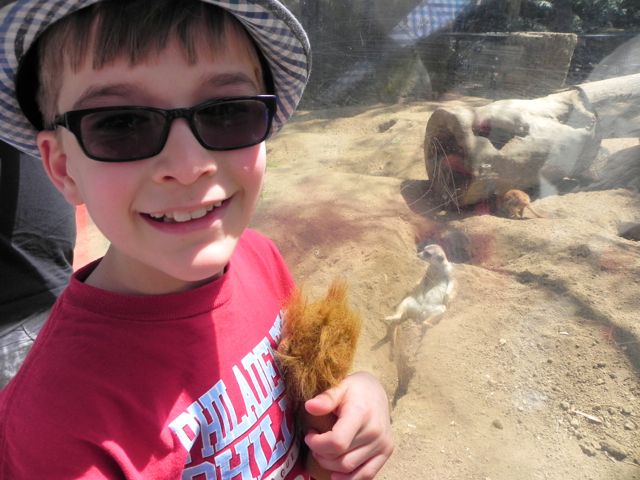 Teddy brought his stuffed lion to meet the meerkats. The kids kept trying to trip poor Robert up. Perhaps my favorite moment other than the Caravan Safari came at the end of the day when we walked past an enclosure where a large tiger paced. I know this picture is blurry, but I wanted to share it to illustrate how close the tiger was – I didn’t use any kind of zoom lens. 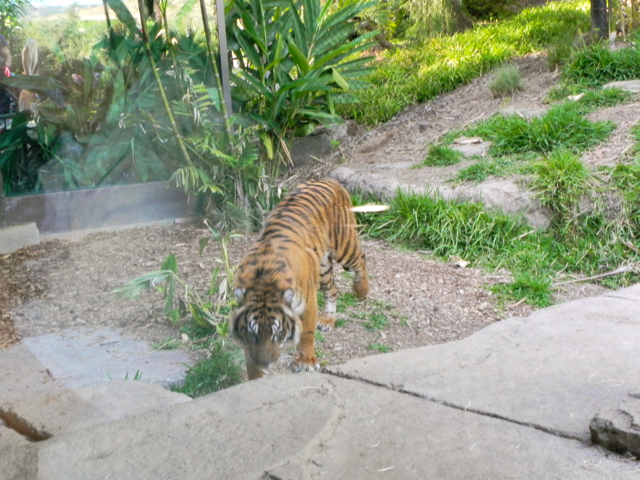 The tiger was pacing fast – I only got a blurry shot. 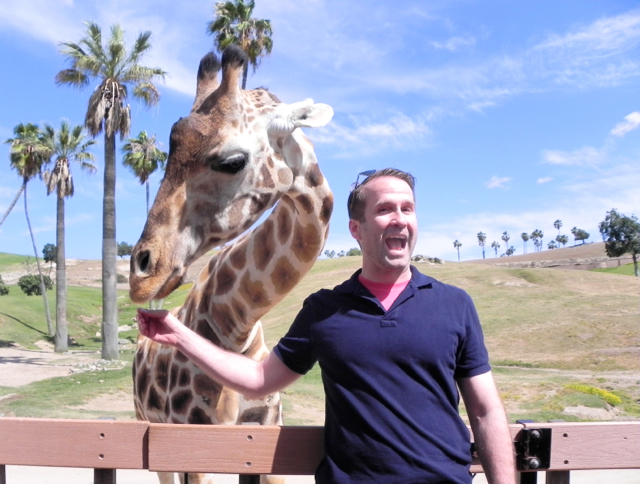 The San Diego Zoo Safari Park is my favorite zoo experience I’ve ever had. Not only is the park absolutely gorgeous – it’s located in the mountains and as I’m sure you can tell from the photographs, the vistas are lovely – it offers tremendous access to both the animals and the people who care for them. I think that Wanda would agree – what do you say? 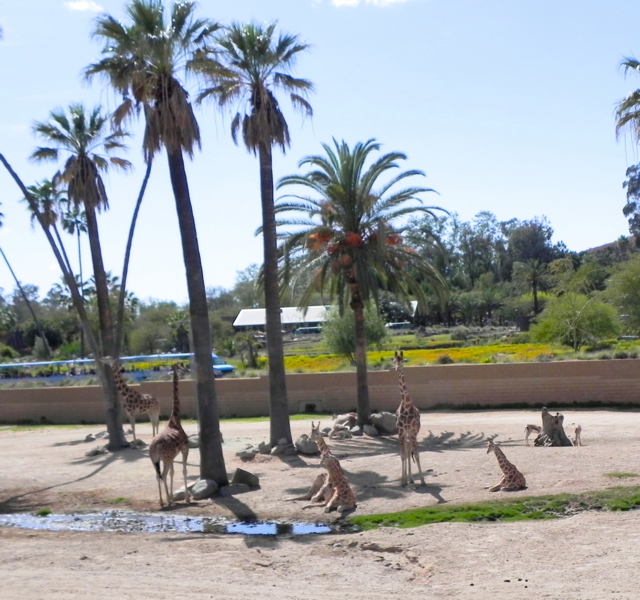 The San Diego Zoo provided us with four adult passes to enter the park; we covered all other expenses, including the fee for the Caravan Safari Tour. You can always count on me to disclose when I’ve received something for free and to share my honest opinions. The Caravan Safari is one of the more expensive one-day activities my family has ever participated in. In addition to paying general admission to the park, taking a caravan safari costs just over $100 per person (that’s also true for kids, who must be 8 or older). Was it worth it? I’d say absolutely because my children love animals and because we were looking for a truly memorable way to experience the park with my in-laws. The tour delivered on both fronts. Caravan Safari tours take about two hours and depart at assigned times (you will be given the time of your tour when you purchase your tickets). The caravan is shaded and comfortable and water is provided – but you need to use the bathroom before you get on board as there aren’t any breaks. 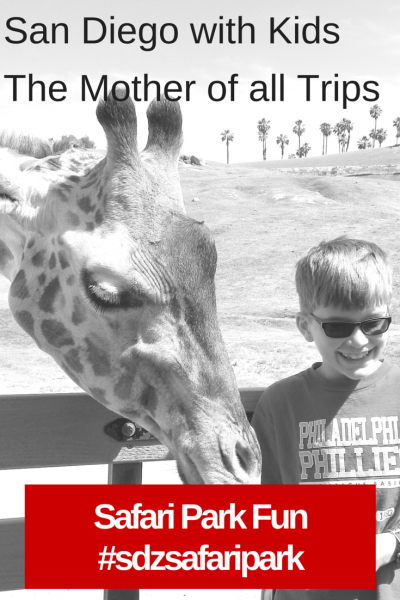 It would easily be possible to have a very fun day at the Safari Park without paying extra for any of the special Safari experiences (if I had younger children, this would definitely be the approach I took). We were there for seven hours and didn’t see or do everything. The Africa Tram circles part of the area we saw on our Caravan Safari; rides on it are included in the price of admission. In addition, most of the other safari experiences cost less than the Caravan Safari. The park is quite large – I recommend a stroller for younger kids. Food at the Safari Park is theme-park expensive but varied. We had a large, late breakfast before arriving at the park and so only the boys needed any lunch and a late-afternoon ice cream snack. The kid’s meal comes in a cute tote bag with a reusable cup. I recommend buying tickets and booking safaris online. Some of the safaris may be cheaper that way and you won’t have to wait in line when you arrive. 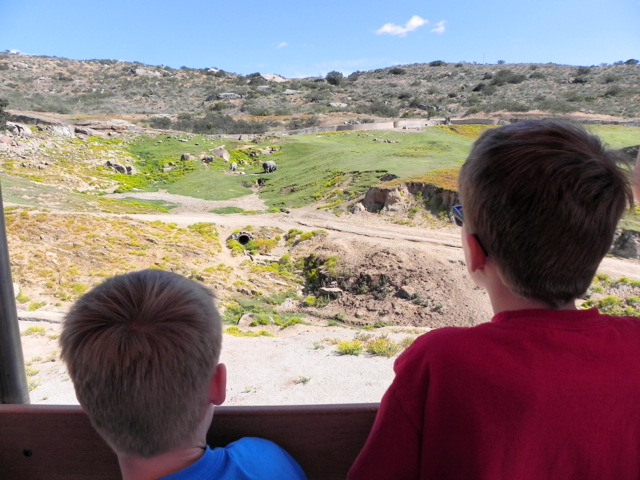 We visited the San Diego Zoo Safari Park during spring break, when it was open until 6 p.m. The park is located in Escondido, about 35 miles from downtown San Diego. We were staying on Coronado, just outside the downtown area, and we chose to wait until after rush hour on the midweek day we visited to drive up there. Leaving around 9:30, we didn’t hit much traffic and the drive took just under an hour. When we arrived, it took close to an hour to get into the parking lot (partly because you must also pay to park), get up to the ticketing area, and to wait in line and purchase tickets. I didn’t mind since I knew we could stay until the park closed (which we did) but if you need to leave earlier you probably want to also hit the road earlier as well, especially if you are visiting during a busier season or holiday. Great pictures! 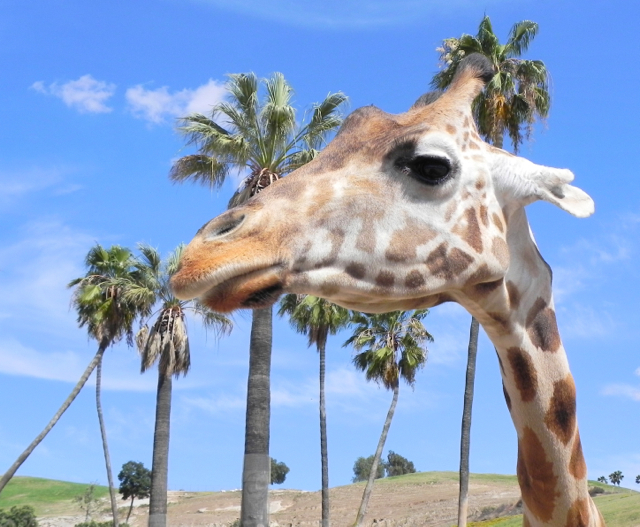 We love the San Diego Safari Park, it is definitely one of our favorite attractions in the area. Looks like you had a fun day. Beautiful photos! 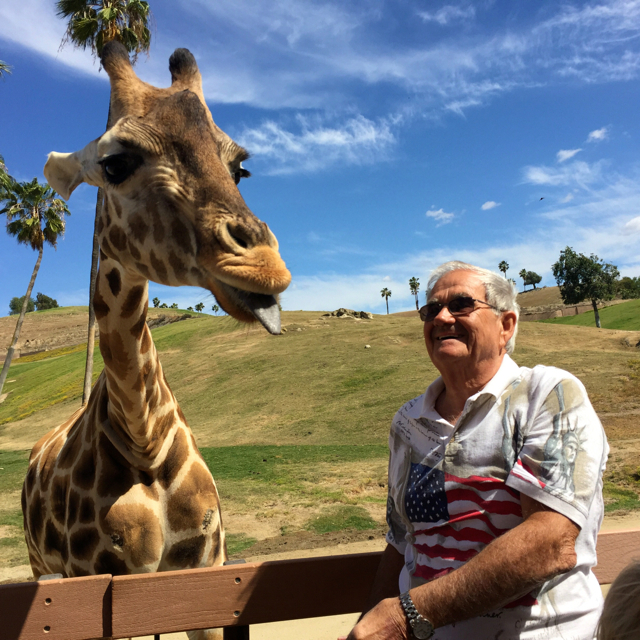 San Diego Safari Park is a great place to visit for fun family activities. Hello! I really enjoyed your write up. If you were to choose the zoo or safari park, which is your preference? I have 2 high schoolers. Also, for the hefty price, was it worth the caravan experience? Can you see if the cart experience gets you just as close to the animals? Thanks.